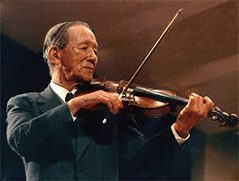 A mandate of the Society for Talent Education is to provide training for teachers in the Suzuki philosophy and methodology. Much of this training goes on at the Alberta Summer Suzuki Institute, however we do have regular workshops throughout the year for teachers. 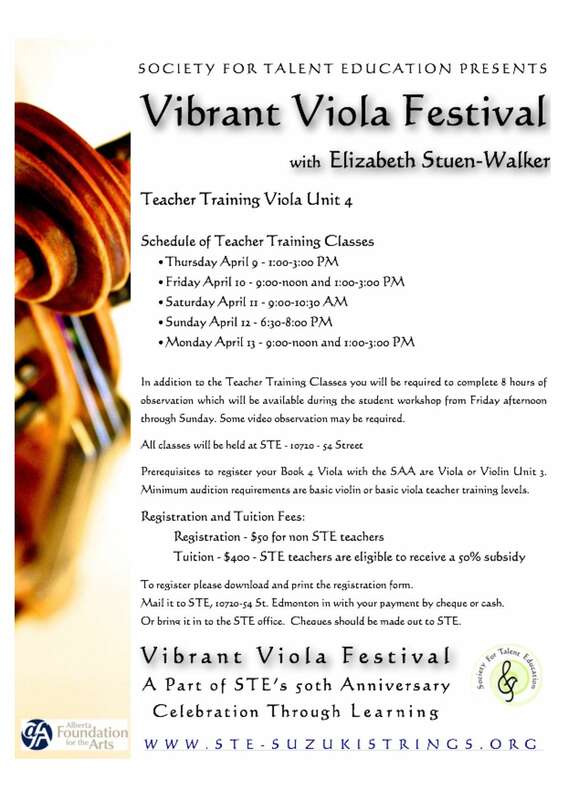 The next teacher workshop will be part of our Vibrant Viola Festival with Betsy Stuen-Walker. We will be offering the SAA course unit 4 viola from Thursday April 9 through Monday April 13. This will be an SAA registrable course for anyone with violin or viola unit 3 and minimum of the intermediate level audition. Others may take the course as auditors. Elizabeth Stuen-Walker is a Suzuki Viola Teacher Trainer. She maintains a studio in Bellingham, Washington, where she teaches viola, violin, serves as a church choir director, and is a member of the Whatcom Symphony Orchestra, Harberton String Quartet and NOEL Ensemble. She received a BM from the Eastman School of Music and a MM from Yale University School of Music. Following her graduate studies, she taught at the Preucil School of Music and Cornell College in Iowa and played in the Tri-Cities and Cedar Rapids Symphonies prior to returning to her native state of Washington in 1984. Ms. Stuen-Walker is an active Suzuki viola and violin clinician throughout the world. She has taught at many of the World Suzuki Conventions, and has taken the Premier Viola Ensemble to Ireland, Australia, Canada, Scandinavia, Japan, and Germany. She has served twice as a member of the SAA Board of Directors. She is a former SAA Journal Viola Column Editor. Ms. Stuen-Walker has 3 volumes of viola ensembles entitled “Violas in Concert”, a volume “Treble Clef for Violists”, she edited the 2 viola volumes of Suzuki duets, and most recently had two volumes of Viola Christmas Ensembles published.